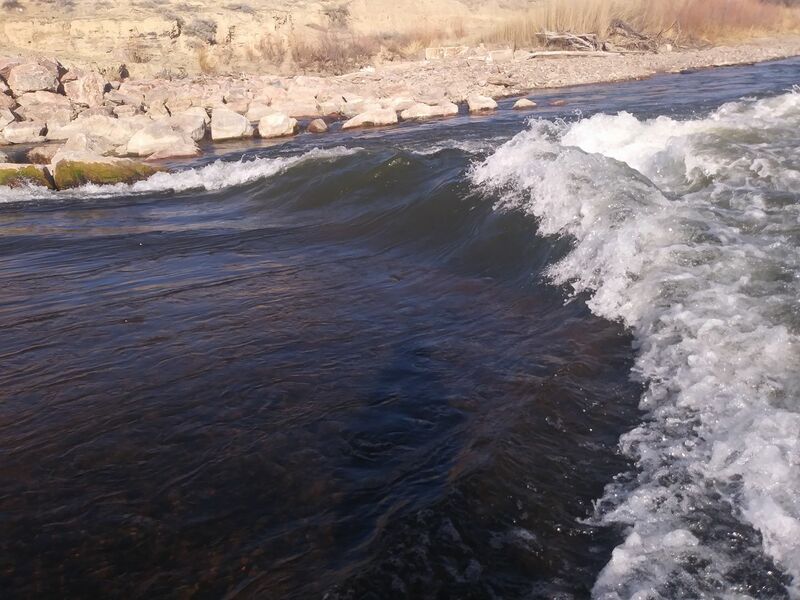 The Florence River Park has an a new wave that can serve as a savior for the Front Range in low flow years. Flows in the mid 200s or so are enough for a surf if your fins aren’t particularly fragile – the photo above is in that range. It surfs better higher though. Mid-300s were giving up surfs on a Badfish iSk8 and paddleboards. More water is better until 1,000 cfs or so, which is the prime flow, plus or minus 50 cfs or so. At those levels it forms a green face with a small, retentive pile on top and green shoulders that have enough power to give up great rides. Between 1,000 and 1,600, more of a pile starts to develop in the center of the wave, so it gets even more retentive but less glassy. The shoulders to the side of the foam ball still surf well even at higher flows. The current working title/name for the wave is .38 Special. You can certainly surf a longboard here at lower flows, and real short wakesurfers can work if you’re real delicate about it as the flows come up, but for the most part stick to higher-volume boards with lower flows. With higher flows (450+ or so), surfers have been having good luck with fish-style boards in the 6′-6’6″ range like this. The State of Colorado took over the USGS gauge at Portland Colorado, which is just downstream of the wave. It should give a relatively accurate reading of the flows at the wave. The park has its own dedicated parking area near the wave. You should drive there and walk to the obvious wave.